A series of programming focused on climate change, collaboration and community will take place during the course of the exhibit. 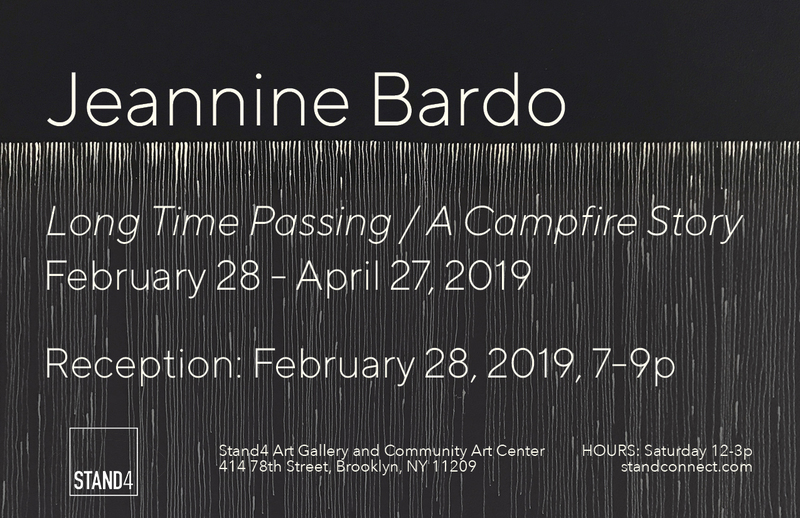 Jeannine Bardo is a multidisciplinary artist whose work focuses on humanity’s connection to the natural world. For this exhibition she created an installation that responded to the interior and exterior space of the gallery, our propensity to inflict violence on what we choose to control and the inherent beauty that surrounds us that we refuse to see. …[I]t’s not the world that needs saving, it’s us. For us to be saved, as a lot of the very old myths say, we’ll have to come home and be born again. We whisper stories around the fires we’ve made for ages and while the Campfires burn, another Paradise is lost. New languages form from the ashes and, though the characters change, the stories stay the same. Our stories justify our rights over the rightless ones and extend our lifelines. We, forever confused with the language of life, refuse to see and hear our ghosts and our fires continue to rage and consume. Long time has passed and we can’t still our minds. We tell ourselves stories when we don’t comprehend. We tell ourselves stories when we are to blame. We tell ourselves stories when we are afraid. We tell ourselves stories when we need meaning and we tell ourselves stories when we are awed. This exhibition is about the stories we tell ourselves as we live through a lifetime of witness. The witness of violence and beauty and the choices we make as a character in the narrative.